Only a small number of books have been published on bullying and its prevention among small children. Nevertheless, recent research clearly indicates that bullying does happen already among children aged 3 to 6 years and preventive measures should be carried out already at preschool environment. Peer relations play a significant role in childhood growth and development. At their best, cooperative activities offer shared experiences of success, learning, joy and fellowship. At their worst, they create conflicts which, when left unresolved, can endanger a child's balanced development and may lead to bullying. It may result significant detrimental and long-term effects on a child's social, mental and physical development. In her book Bullying and its prevention among small children, Laura Repo, a pedagogics researcher, introduces her readers to various aspects of the bullying phenomenon among early childhood educational groups. The book is based on PhD research and extensive data and observations among children and day care professionals in their everyday situations. The book begins with the bases of anti-bullying work methods with small children and definitions of what constitutes as bullying. In the second part, the book approaches the principles of anti-bullying methods in a practical manner and introduces various mental and practical tools for the prevention of bullying behaviors. The basic premise of Repo’s perspective is that cathegorizing small children as bullies or their victims should be avoided. The prevention of adverse behaviors is based on the view that bullies are equally entitled to the appropriate pedagogic approach which enables them to learn how not to bully others and still successfully their intentions. For example, it is important that the caregivers and teachers understand why punishing the bullies is useless and does not lead to their amending the bullying behavior. 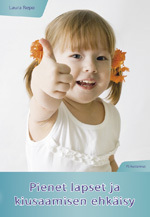 This book is aimed at anyone working with small children but it also offers valuable insights for parents.